The little brunch party I threw this weekend was officially designated Wafflepalooza, but, as the summer breeze continued to ease its way over Lake Michigan and the mimosas kept flowing into the afternoon, the event segued into a new identity, the first official meeting of what I am pleased to call the Chicago and North Shore Croquet Association. And let me tell you, we dealt out some hurt. Lisa Alcala, Mary Moss and Alan Moss (artist and famed illustrator of the American Science and Surplus catalog, and future designer of the C & NS Croquet Assoc. tee-shirts) had to leave before the full tournament, but the remaining members witnessed rough-terrain play of a savagery not seen since the Punic wars. Sara Ellis took an early lead in the nine-wicket cut-throat event, but suffered an irrecoverable setback when she was unsportingly roqueted back beyond the starting point by a disreputable literary critic after clearing the seventh wicket. Ben Goluboff, playing the black ball, looked set to take the lead but was challenged first by myself and then by Jason Salavon. Glouboff, set to clear the final wicket, was roqueted not once but twice right out of the field of play and into the rough in the nearby Adams-Hart estate. Rallying to re-enter play from beneath some underbrush, he showed admirable game but was unable to challenge for the lead again. Meanwhile I, having sent Goluboff off to the bushes, left myself open to a stunningly aggressive attack by Salavon at the eighth wicket, and was saved only by some rough terrain. Ornithologist Caleb Gordon and the lovely and talented Valerie Archambeau played with spirit but, caught up in mutual recriminations and subject to Gordon's penchant for the two-ball croquet attack, neither were factors in the final phases of the game. 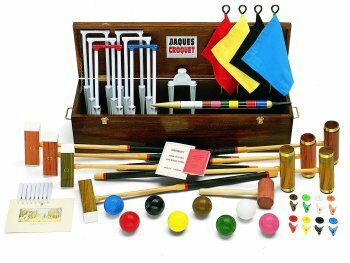 Tippling Gadabouts beware: the noble sport of croquet has entered a new phase. No more the regulation whites on the well-manicured lawns, no more the gentle tock-tock of ball and mallet. The Chicago and North Shore Croquet Association has arrived, and we've been dealin' hurt since 2005.